Open access is the free, online access to the outputs of scholarly research. Open access allows research outputs to be accessed worldwide by scholars, students, professionals and the wider community, to make any lawful and non-commercial use of the research material(s) without legal, technical or financial barriers other than the acknowledgement of the right of the author(s). 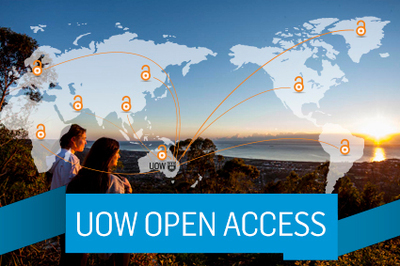 The UOW Open Access Policy was launched in March 2014. We are committed to the dissemination and promotion of its research findings as widely as possible. A significant mechanism to do this is through the deposit of publication metadata and final manuscripts into the University's institutional repository, Research Online, in accordance with the principles of Open Access. UOW maintains a position to not pay for the publishing of online research where possible and supports a Green approach to Open Access. Authors can self-archive, via an institutional or subject repository, accepted manuscripts at the time of submission of the publication.